This simple living room chair has a contemporary element that is urban and sophisticated. A piece built for comfort and designed for style, this modern chair features smooth lines to create a soft natural style. Exposed wood block feet and welt cord trim accent this chair. This modern living room chair is chic and comfortable. 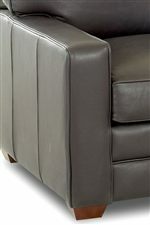 The Selection Contemporary Living Room Arm Chair by Klaussner at Van Hill Furniture in the Grand Rapids, Holland, Zeeland area. Product availability may vary. Contact us for the most current availability on this product. The Selection living room furniture collection is full of chic contemporary style. Crafted with quality materials, this set provides a sophisticated elegance and a natural comfort with a pleasing contemporary aesthetic. The Selection collection is a great option if you are looking for Contemporary furniture in the Grand Rapids, Holland, Zeeland area. Browse other items in the Selection collection from Van Hill Furniture in the Grand Rapids, Holland, Zeeland area.